Andrew Adamson's film adaptation of Lloyd Jones' award winning book Mr Pip is released throughout cinemas in New Zealand and worldwide this week. The film is set in Bougainville during the civil war and follows 14 year old Matilda, her mother and Matilda's teacher Mr Watts throughout this violent time. After years of isolation, Bougainville is slowly reopening and Heritage Expeditions is due to be the first expedition company to visit Arawa, the settlement at the centre of the conflict, on the upcoming Melanesia Discoverer voyage departing next week. Bougainville is a pristine island paradise – home to some of the greatest biodiversity in the region both above and below the waters. We also look forward to visiting the local communities based on the island, and spending time with them to learn more of their history and plans for the future. 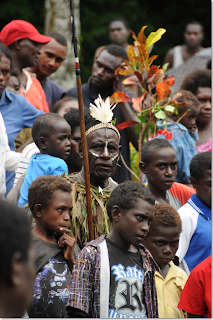 The 14 day expedition, Melanesia Discoverer, departs Madang, Papua New Guinea on the 11th October. Melanesia Discoverer 2014 – departs Madang, Papua New Guinea on the 8th October 2014.